Mariz designs and manufactures hydraulic underbody tipping cylinders from 1 stage up to 9 stages for dump trailers and for all other types of tipping applications. Mariz has fully automated production and decades of experience in designing and engineering hydraulic cylinders for the leading tipping vehicle manufacturers, using state-of-the-art machinery and advanced technologies. Mariz telescopic hydraulic underbody cylinders are manufactured using the most accurate machining to achieve the finest finish and precise tolerances. Chrome plated stages and external zinc plated finished tubes are also available upon request. We have an exceptionally wide product range, suited to almost every tipping vehicle type and its intended application. Selling our products in the world market, almost each country having its own cylinder models’ selection, we design and produce a vast quantity and variety of cylinders offering many configuration options, not only for sizes (diameters, number of stages, stroke) and oil inlet position (located in the trunnion or directly in the external tube) but also for attachment type. We have cylinder with lower trunnions (which can be located at different positions along the external tubes) and top eye. Alternatively we can have cylinders with lower trunnions and top ball with a round shape socket or a 4-hole square shape socket (which can be attached to the bottom of the tipping body by welding or screwing the 4 bolts). Additionally we also can have top and bottom eye cylinders (also available in a lower bottom bushing version). Here below we present a first selection of standard agricultural underbody cylinders with lower trunnions and ball on top, as a first criteria to find out the suitable cylinder sizes. More catalogues available in the Reserved Area. Custom design cylinders are always available: please contact our sales team. 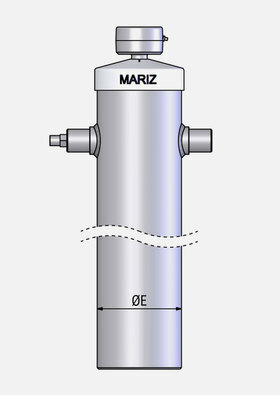 Mariz cylinders are designed to suit 1-way, 2-way and 3-way tipping vehicles, both for agricultural and light/medium duty commercial applications. For additional items of heavy duty range, please see our Binotto underbody cylinders. Bespoke bracketry, cradles and special body accessories are available for easy fitting and perfect installation. Mariz also offers complete PTO-pump hydraulic systems and electric power-pack systems including button control panel.